Mayor Elizabeth Tisdahl stops by Dillo Day in 2014. 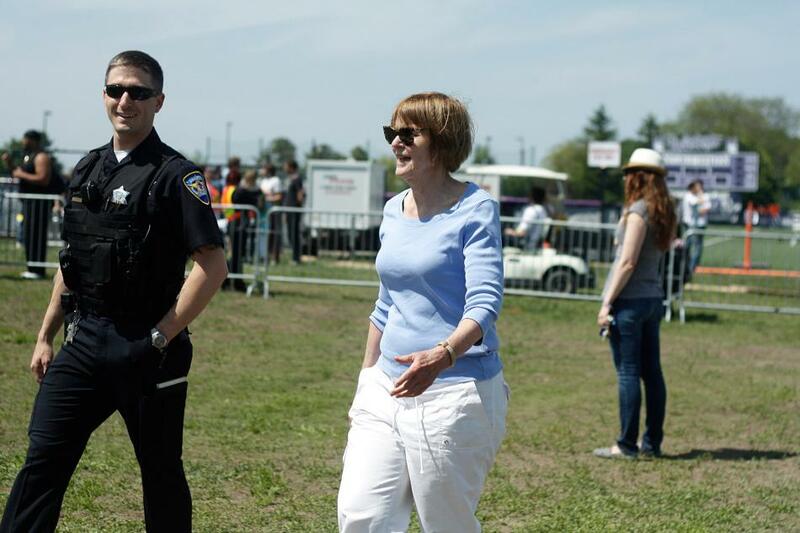 The mayor called the annual Mayfest event pleasant even though she received a record number of complaints from Evanston residents. A purple Northwestern football helmet sits on the corner of Mayor Elizabeth Tisdahl’s desk. While browsing her email, she talks about how she loves bringing her 11-year-old grandson to games and sitting on the sideline with University President Morton Schapiro. 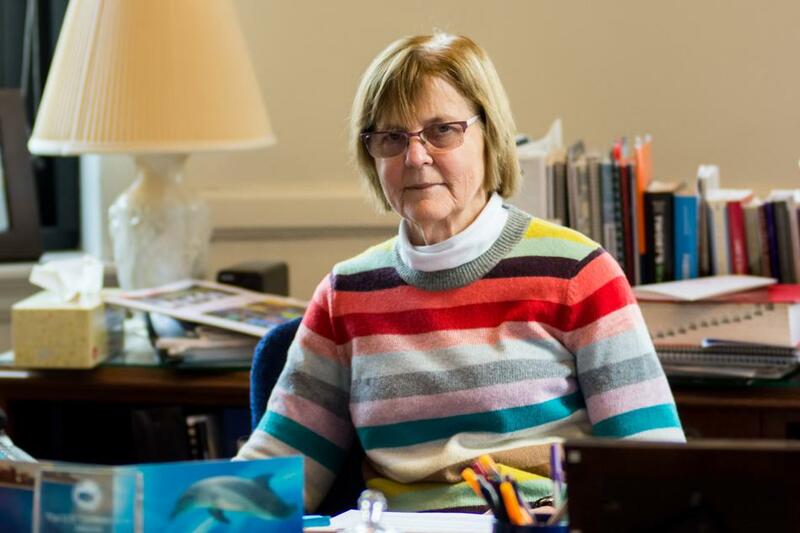 But when Tisdahl, 68, took the field this year, she was met with boos from students, still angered by her 2012 decision to revoke the liquor license from the legendary student watering hole, The Keg of Evanston. Since the Keg’s closure, students have parodied Tisdahl as a prohibitionist. The rumors have gone so far that the city’s website even included The Keg on a “Fact vs. Fiction” page, where the city dispels local lore that NU students party too much and bowling is illegal. 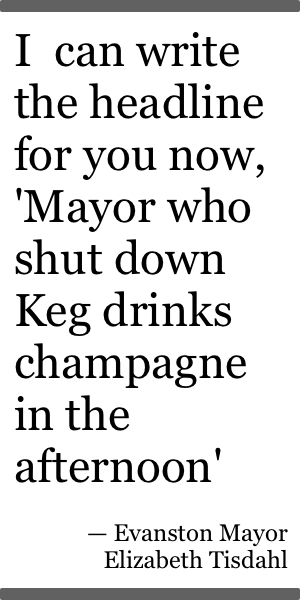 The city writes the rumor “Tisdahl forced The Keg out of business” is a myth, clarifying she revoked the liquor license and the business subsequently closed more than a year later in March 2013 when the property’s owner refused to renew the bar’s lease. But almost two years later, many students — even students who had not yet applied to NU when the Keg’s doors (and fence) were open — know only the myth, not their mayor. On a recent afternoon, that same mayor took a sip of champagne at an afternoon groundbreaking for the Evanston Art Center on Central Street. With a playful smile, she joked she could pen her own profile. 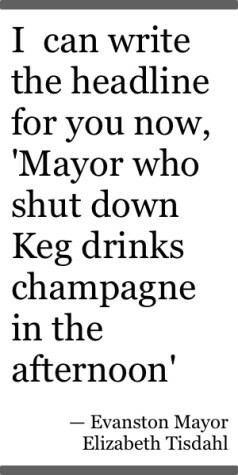 “I can write the headline for you now, ‘Mayor who shut down Keg drinks champagne in the afternoon,’” she joked. Despite flare-ups over the so-called “brothel law,” The Keg and Dillo Day, many believe town-gown relations have improved under the mayor’s tenure, which has been marked by a strong relationship with Schapiro. Kevin Harris, Associated Student Government community relations vice president, said the mayor has always been supportive of NU and receptive to students’ concerns. Tisdahl said she felt obligated to revoke The Keg’s liquor license after receiving repeated calls from parents complaining about their high school students flocking to the bar. Whether they slipped by the bouncers posted at the front door or jumped over the fence in the alley to sneak in the rear entrance, underage drinkers knew The Keg had a reputation for letting them through its doors. The Keg, previously located at 810 Grove St., was featured on more than one list of top college bars. Tisdahl said she knew closing a university’s favorite bar would never be popular, but she never expected the response she would receive from students — or even their parents. “Some students even had their parents write to me to say that closing The Keg was dangerous for their children because they would have to go farther from campus to drink,” Tisdahl said. Students also lambasted the mayor over the city’s “brothel law,” an occupancy ordinance that bans more than three unrelated people from living in the same unit. The law, which has been on the books in some form since 1960, became controversial in early 2011, when they city said it would begin enforcing the policy on July 1 of that year. These plans stalled after 500 students protested at a town hall meeting. Tisdahl and others have touted possible changes to the law. Ald. Don Wilson (4th) is working on an alternative proposal to update the code, she said. Tom Aunins, the current editor in chief of Sherman Ave, joined the publication at the tail end of the Tisdahl coverage. He said the website published dozens of columns mentioning Tisdahl because she seemed to embody the ongoing strained relationship between Evanston residents and NU students. “It was more of trying to find a scapegoat for what was going on at the time than actually hating her as a person or anything like that,” Aunins, a McCormick junior, said. Beyond campus publications, fake Twitter accounts describe her “attempts” to take underage communion wine drinkers off the street. She only recently became aware of the fake accounts when she won a national award for creating youth jobs. Mayors of other towns attempted to connect with her via the social network but instead were contacting the fake account. She rectified the problem by starting to tweet herself last month from @EvanstonMayor. “Sometimes I read them and think, ‘Come on you’ve got to be more clever than this,’” she said. She said she feels there’s nothing she can do to change students’ perception of her. “It’s much more fun to be angry with me,” she said. Although the mayor may feel it’s impossible to change the myths about her circulating campus, Harris and Aunins said they already see a shift occurring. Aunins said Sherman Ave has not published an article about Tisdahl in more than a year, likely because there have been fewer incidents involving the mayor. He said most freshmen and sophomores probably don’t know who she is. Harris said many underclassmen are oblivious to the reputation she built among upperclassmen. “There are plenty of freshmen and sophomores who don’t even know what The Keg is,” Harris said. Harris said he believes few students know much about the mayor because many of her policies don’t directly affect them. Despite criticism from students, Tisdahl has proven popular among Evanston residents. She won her position in 2009 in a landslide with more than 62 percent of the vote. In 2013 she ran unopposed, securing her second term. Tisdahl admits NU students aren’t necessarily her top priority, largely brushing off their criticism with a smile. When Tisdahl first entered office in 2009, she said minorities were leaving Evanston because they were priced out of the housing market. Early in her first term she secured a stimulus housing grant worth $18 million. She said more than 100 families live in new affordable housing created since. The mayor has been particularly passionate about curbing youth violence. Tisdahl said she visits the grieving families of every homicide victim in Evanston. At one home, she spoke to a victim’s younger brother, who told her he was afraid to go outside. She said no child in Evanston should ever feel that way. In addition to a gun buyback program, Tisdahl has specifically focused on youth engagement to bring the crime rate down. In January she gained national accolades for her youth summer employment program, which provided more than 500 jobs to Evanston teenagers. The Evanston mayor isn’t backing down from these goals. This year, her staff wants to increase their progress from last year and create 600 summer jobs for youth. Her reach extends beyond the city, particularly in her role as the Northwest Municipal Conference president, in which she represents 43 municipalities and one township. The mayor has had a busy introduction to this role, particularly in lobbying in Springfield against Republican Gov. Bruce Rauner’s proposed budget cuts that would halve the percentage of state income taxes allocated to local governments. Additionally, she is working to address pension fund woes. The same day she attended the art center groundbreaking, she said she was scheduled to have a call with Chicago Mayor Rahm Emanuel. He canceled after he failed to secure 50 percent of the vote in the Chicago mayoral primary and had to instead campaign for the run-off election. Despite Tisdahl’s progressive goals for herself and her staff, her expectations for Evanston’s temporary residents aren’t very high. Even if students are only here for four years, she said they contribute to the diversity she loves about the city. “You are all a plus,” she said. On the whole, Tisdahl said she feels the community’s relationship with the University has improved in recent years, repeatedly telling students and campus media the “Hundred Years’ War” between the University and city is over. In 2012, The Princeton Review ranked the NU-Evanston relationship the 4th “most strained” in the country. The University and the city dropped off the list in 2015. The change in the relationship is the result of gradual initiatives for the University and city to communicate with each other more, Tisdahl said. For example, the University has been on board with her jobs plan. In the first year, NU committed to four summer jobs for Evanston youth. This year they committed to 24. The mayor said the University does much to support local business, and some NU entrepreneurs bring new business to the city. The city reciprocates at events like Homecoming, when downtown Evanston storefronts display their purple pride with Wildcat-themed displays and spouting purple water from the downtown fountain. Harris said the mayor, along with the aldermen, have been largely receptive to the ideas he’s brought to them on behalf of students. He said the city and student government have worked together on initiatives that will bring the Divvy bike sharing service to Evanston and increase the scheduled Purple Line Express trains in May and June. Both ASG and the University have attempted to increase programming with Evanston Township High School, ranging from special events for prospective students to pairing student groups from NU with student groups at the high school. The mayor specifically pointed to Wildkits Days, where students from ETHS visit campus. “Every kid in Evanston deserves to at least see a college campus,” she said. The city has also formed a partnership with NU’s Center for Civic Engagement. Although Tisdahl didn’t make many friends in the student body when she took away The Keg’s liquor license or considered enforcing the “three-unrelated rule,” she has a close friend in Schapiro. Tisdahl echoed the president’s sentiments. One of her most memorable achievements as mayor came when she scored the stimulus funding to create affordable housing. Shortly after, she got a call from Schapiro and told him she was having the best day ever. “And he just said, ‘Why, because I’m calling you?’” Tisdahl said. But other parties make her life much more difficult. She said she was having a pleasant Dillo Day last year, even stopping by the beer garden on campus. But the next day, she had the most complaints she ever had about the event because the stage and speakers were facing a different way due to campus construction. 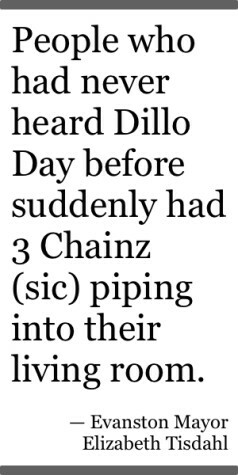 “People who had never heard Dillo Day before suddenly had 3 Chainz (sic) piping into their living room,” she said. Schapiro subsequently wrote a letter to Evanston residents apologizing. Tisdahl said age-driven conflicts like these are unavoidable. She said problems often arise when students are partying late into the night. Still, she acknowledged relations in Evanston were better than other university towns, saying people have told her it is “paradise” in comparison. As for trying to change her reputation?